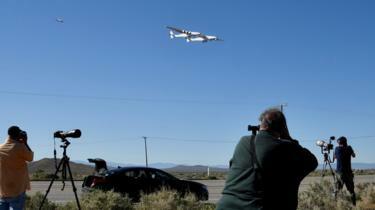 The world’s largest aeroplane by wingspan has taken flight for the first time. 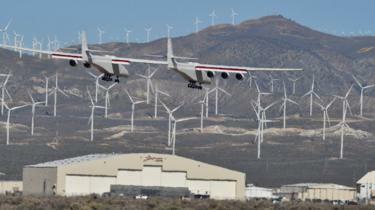 Built by Stratolaunch, the company set up by the late Microsoft co-founder Paul Allen in 2011, the aircraft is designed to act as a flying launch pad for satellites. The idea is to fly the plane to 10 km (6.2 miles) before releasing satellites into orbit. Its 385 ft (117 m) wingspan is the length of an American football field. The twin-fuselage six-engine jet flew up to 15,000 ft (4,572m) and reached speeds of about 170 miles per hour (274 km/h) on its maiden flight. The pilot Evan Thomas told reporters the experience was “fantastic” and that “for the most part, the airplane flew as predicted”. According to their website, Stratolaunch aims to “make access to orbit as routine as catching a commercial airline flight is today”. British billionaire Richard Branson’s company Virgin Galactic has also developed aircraft that launch rockets into orbit from great height. 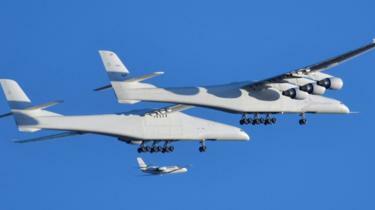 Stratolaunch describes its vessel as the “world’s largest plane” but there are aircraft which are longer from nose to tail. 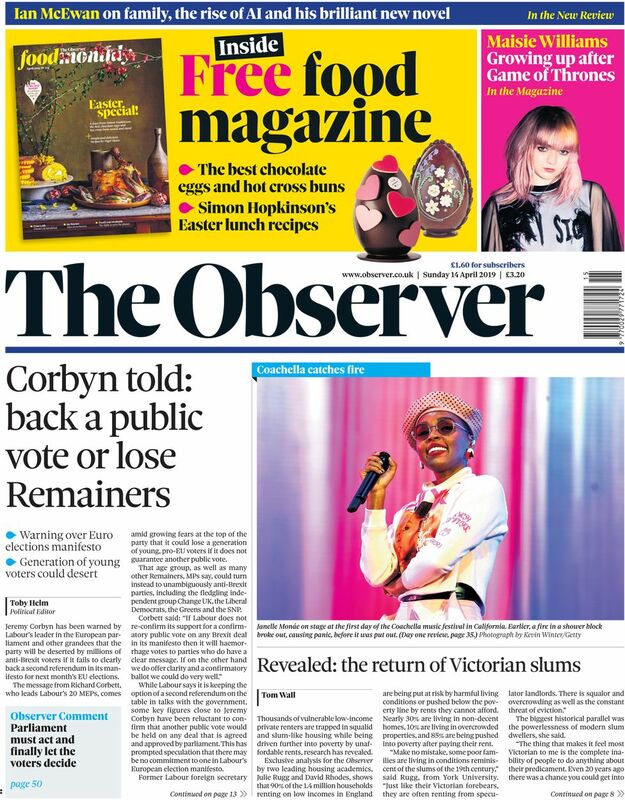 The Observer, however, leads on a warning from Labour’s leader in the European Parliament that the party will be “deserted by millions of anti-Brexit voters” if it fails to give clear backing to a further EU referendum. 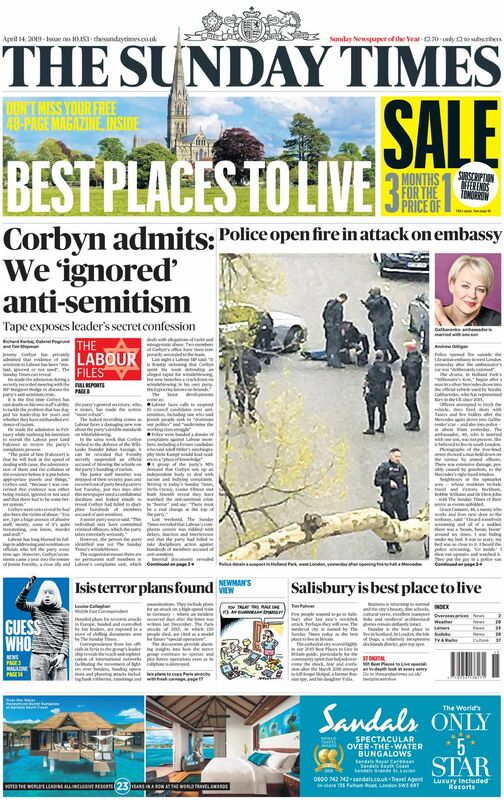 Meanwhile, the Sunday Times reports what it says is a private admission from Mr Corbyn that evidence of anti-Semitism within the Labour party had been “mislaid, ignored or not used”. Labour has previously said it has strengthened disciplinary procedures and made the complaints procedure more robust. Talks between Mr Corbyn’s senior colleagues and Conservative ministers continue in a bid to find agreement over a Brexit deal that can secure the backing of a majority of MPs. 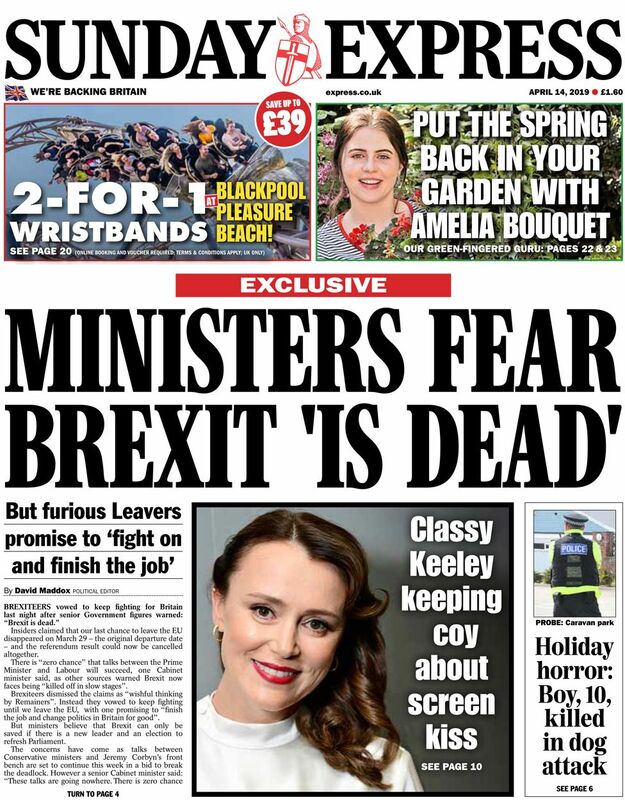 But the Sunday Express says some senior government figures believe there is “zero chance” of them succeeding and that “Brexit is dead”. 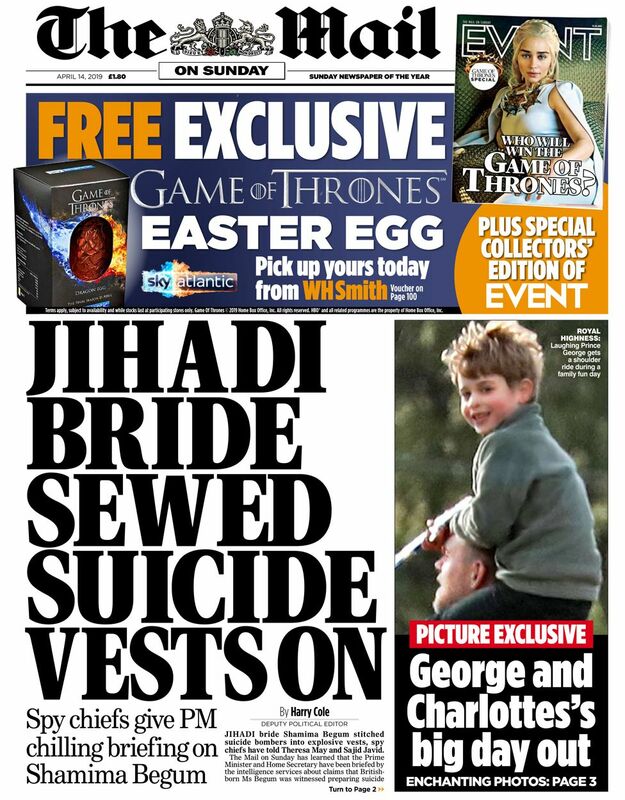 The Mail on Sunday reports that intelligence chiefs have briefed Prime Minister Theresa May and Home Secretary Sajid Javid about the “Jihadi bride” Shemima Begum. The teenager, who ran off to join the Islamic State group in 2015, is said to have sewed bombers into suicide vests. The Sunday People trumpets an exclusive interview with Laleh Shahravesh, who has returned to the UK after being jailed in Dubai for calling her ex-husband’s new wife a “horse”. 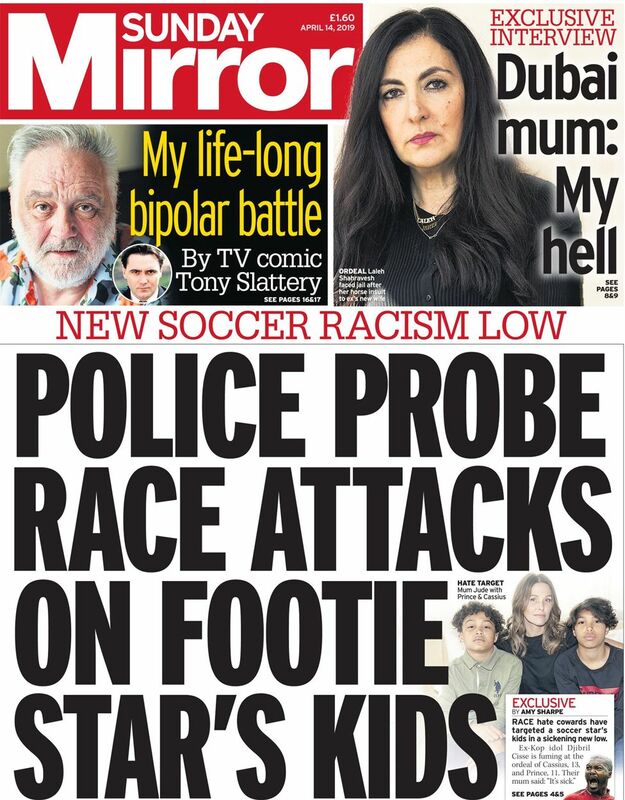 Meanwhile, the Sunday Mirror says police are investigating the alleged racist abuse of the children of former Liverpool footballer Djibril Cisse. 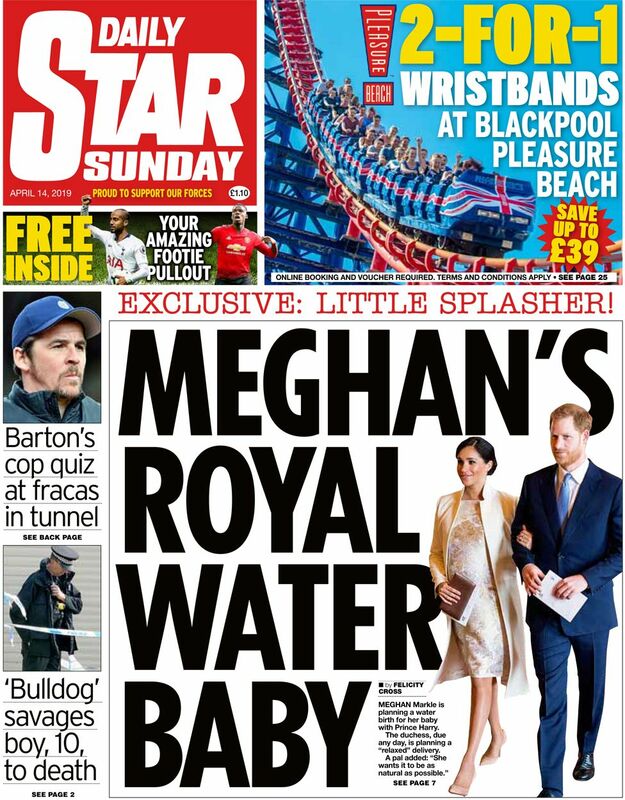 Finally, the Daily Star Sunday suggests the Duchess of Sussex is planning a water birth. Meghan is planning a “relaxed” delivery of Prince Harry’s baby, the paper quotes a “pal” saying. 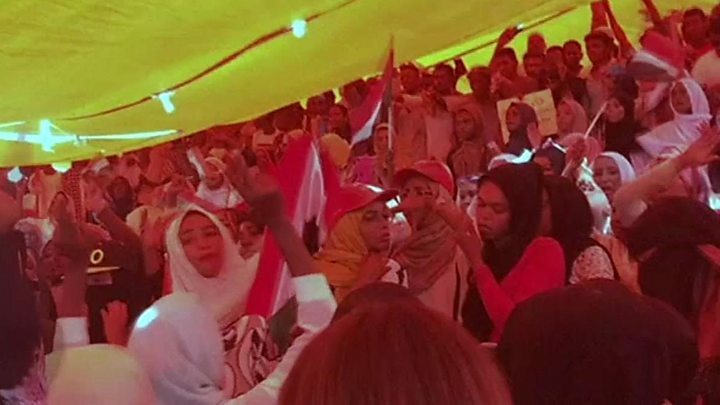 Dozens of men, women and children from Pakistan’s minority Hazara community have held a protest in the city of Quetta demanding better security. 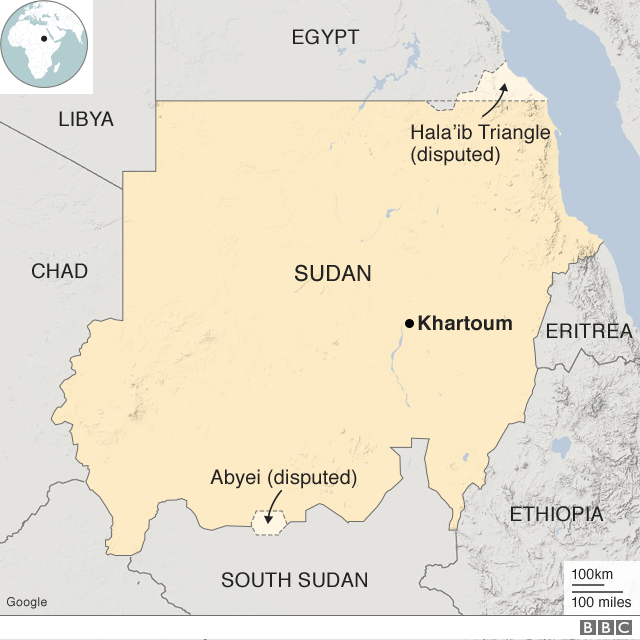 The sit-in started hours after 24 people were killed and dozens injured in a bomb blast at a vegetable market in the south-western city. 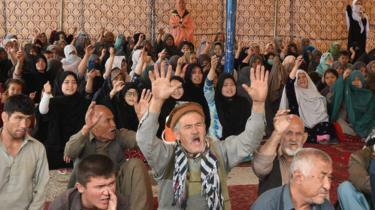 Many victims were from the Hazara community, who are mainly Shia Muslims. The community has been frequently targeted by extremists from Pakistan’s Sunni Muslim majority. Both the Pakistani Taliban and the Sunni militant group Islamic State (IS) said they had carried out the attack. 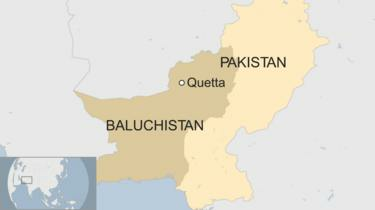 Quetta, a city in Baluchistan province that is home to more than half a million Shia Hazara, has witnessed the majority of IS attacks in Pakistan. A man disguised as a labourer detonated a bomb inside the Hazar Ganji, a fruit and vegetable market on the outskirts of Quetta, city police chief Abdul Razzaq Cheema was quoted as saying by Reuters news agency. Baluchistan Chief Minister Jam Kamal Khan Alyani condemned the attack, promising the “best possible” medical care for the injured, according to Pakistan news website Dawn. Those guilty were enemies of humanity, he said. Amnesty International’s Deputy South Asia Director, Omar Waraich, condemned the attack, saying: “This horrific loss of life is a painful reminder of the threats that Quetta’s Hazara community continues to face. Four European Union countries have agreed to take in 64 African migrants who were rescued after being stranded at sea for almost two weeks. The Alan Kurdi ship, operated by the German humanitarian group Sea-Eye, had been refused entry by Italy and Malta. 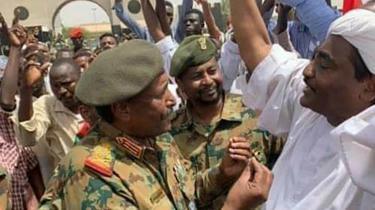 Both countries had said it was Libya’s responsibility, Sea-Eye had claimed. But on Saturday the Maltese government announced that the migrants will be redistributed among Germany, France, Portugal and Luxembourg. “None of the migrants will remain in Malta. The ship Alan Kurdi will not be allowed to enter Malta,” the government said in a statement. 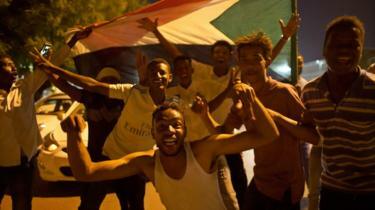 The agreement had come through the co-ordination of the European Commission, it added. Two migrants had already been evacuated to Malta after falling ill on the German ship, named after the three-year old boy who drowned as his family fled the conflict in Syria. “Once again the smallest member of the European Union was put under unnecessary pressure, being asked to resolve a case which was neither its responsibility nor its remit,” the Maltese government said. Three teenage migrants were charged in Malta last month, after “hijacking” an oil tanker that had rescued them. 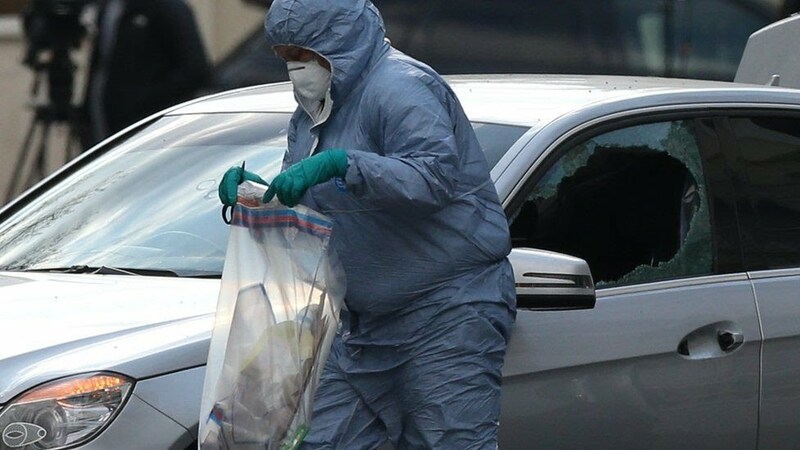 Officers opened fire in west London on Saturday morning while responding to reports of a car collision, the Metropolitan Police has said. The Met said its officers arrived at the scene just before 10:00 BST after “reports of antisocial behaviour involving a car”. 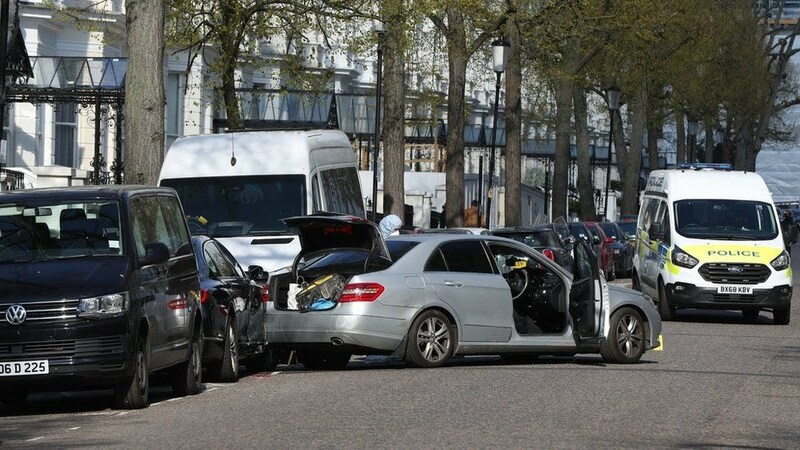 Describing the events of Saturday morning, the Ukrainian embassy said that after seeing the ambassador’s car being targeted, police “blocked up” the other vehicle. 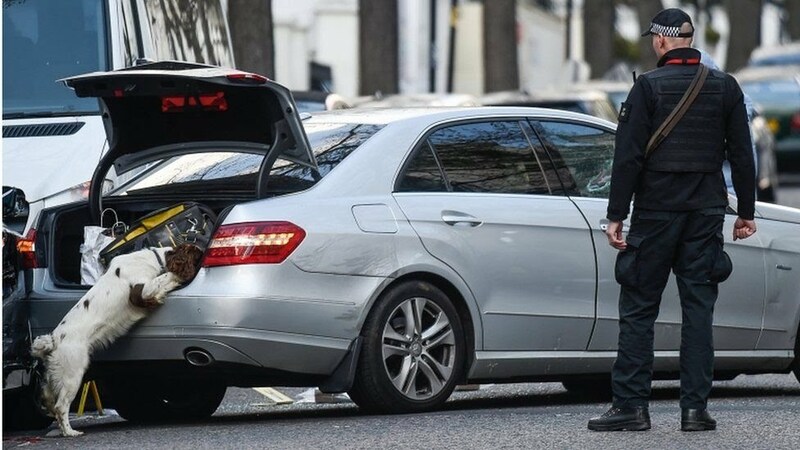 Darcy Mercier, who lives across the road from the Ukrainian embassy, told the BBC the man arrived in the street around 07:00 and was “blasting music”. Mr Mercier said he approached the man and asked him to turn the music off but was ignored. “He sat in the middle of the street for over two hours. 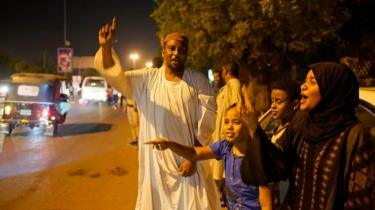 I was out on my terrace when he started ramming the embassy car,” he added. 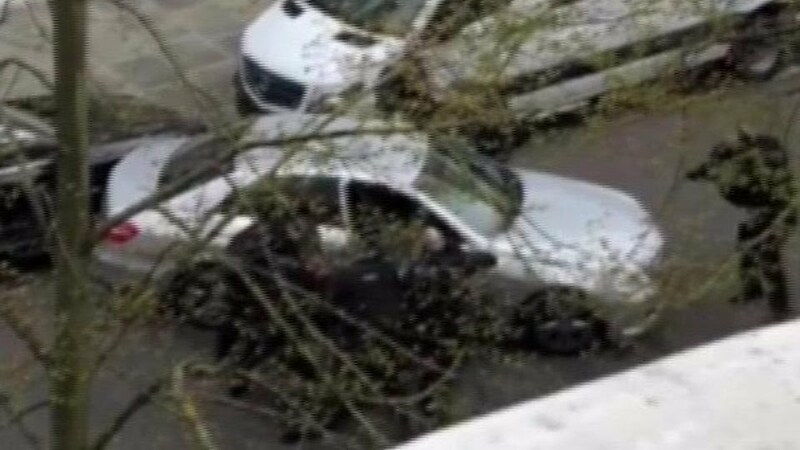 Emma Slatter, who witnessed the arrest, believes the man reversed into the diplomat’s car while backing away from an oncoming police car. “It seems like he was moving erratically or wanting to move away from being boxed in, maybe not realising there were police behind him as well,” she said. 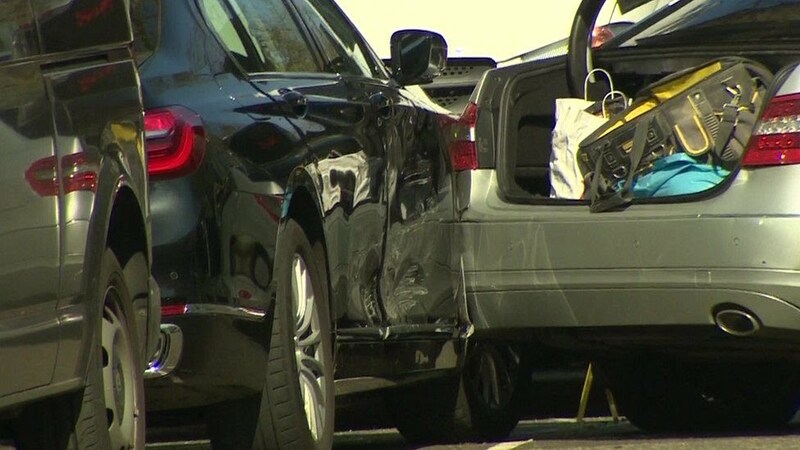 Foreign Office minister Sir Alan Duncan tweeted that he was “very concerned” to hear about the incident and added that he’d spoken with Ukrainian ambassador to the UK Natalia Galibarenko. Very concerned to hear of the incident near the Ukrainian Embassy this morning. I have just spoken to Ambassador Galibarenko @UkrEmbLondon and am glad to hear that no one was hurt. Thanks to the @metpoliceuk for such a swift response. The MP for Rutland and Melton also thanked the police for their “swift response”. 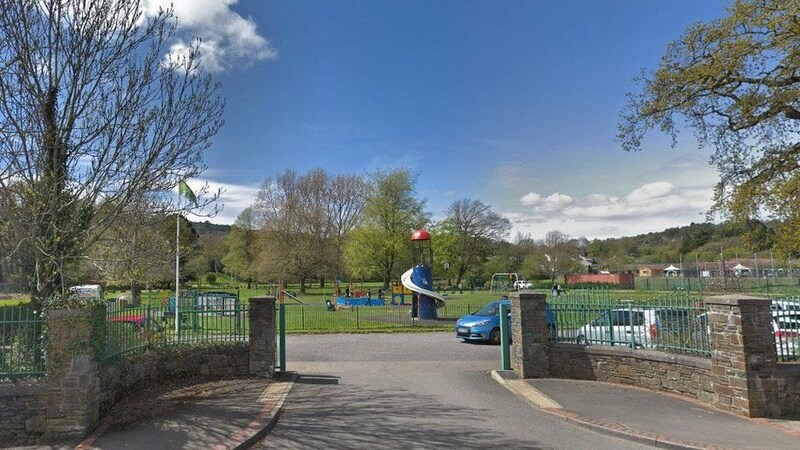 A 13-year-old boy has died after being found unconscious in a south Wales park. Police were called to Ystrad Mynach Park, Caerphilly, at about 19:20 BST on Friday 12 April. The teen was taken to University Hospital of Wales in Cardiff where he was pronounced dead. Gwent Police are treating the boy’s death as unexplained and specialists are working to determine the exact cause of death. His family have been informed and are being supported by specialist officers. Det Chief Insp Sam Payne said: “At this time enquiries are ongoing and the investigation into this young boy’s death are still in the early stages. “Our thoughts are with his family and friends at this time. The boy was found close to trees beside the rugby pitch. Det Ch Insp Sam Payne said: “At this time enquiries are ongoing and the investigation into this young boy’s death are still in the early stages. A man is fighting for his life in hospital after being stabbed in London on Friday night. Emergency services were called to Bounds Green Road in Wood Green, north London, at about 21:30 BST. They found a man, believed to be 19 years old, with a stab wound, near the road’s junction with Nightingale Road. The man was treated at the scene and taken to a central London hospital where his condition was described as life-threatening. Inquiries continue and a crime scene remains in place. 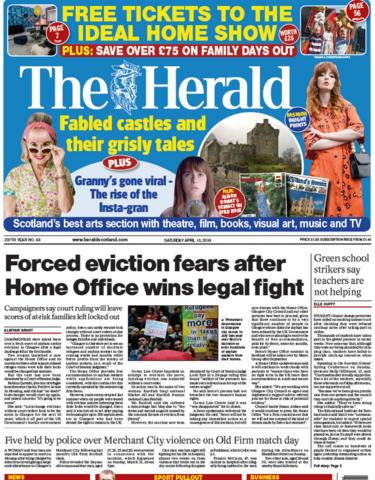 The Herald says there are fears over a “fresh wave of asylum seeker evictions” in Glasgow. It comes after two women lost their fight with the Home Office for refugee status and were told their locks would be changed. The Daily Record focuses on the dog attack on a six-week-old baby in boy in Hawick. The paper says the boy, is in a critical condition in hospital, was at his aunt’s house when he was “savaged by one of her partner’s terriers”. 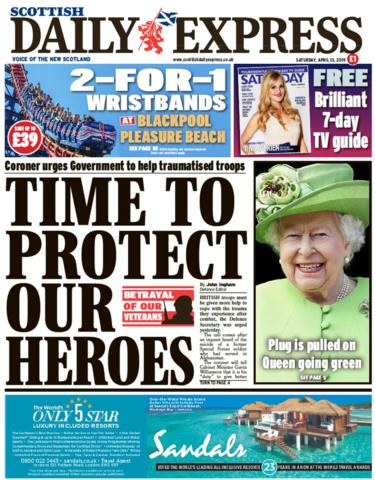 The Daily Express’s front-page highlights another story of an ex-military death as part of its ongoing “Betrayal of our veterans” crusade. It says a coroner has urged Defence Secretary Gavin Williamson to give members of Britain’s armed forces better help to cope with the trauma of active service, following the inquest of a former special forces member who killed himself. 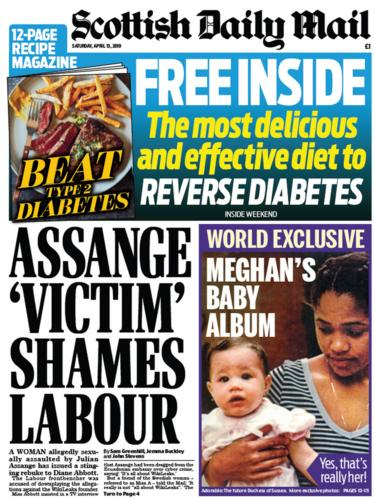 The Daily Mail says a woman who claims she was sexually assaulted by Wikileaks founder Julian Assange has criticised Labour MP Diane Abbott for “downplaying” the allegations against him. Ms Abbott said in a TV interview that Mr Assange had been dragged from the Ecuadorian embassy over cyber crime. 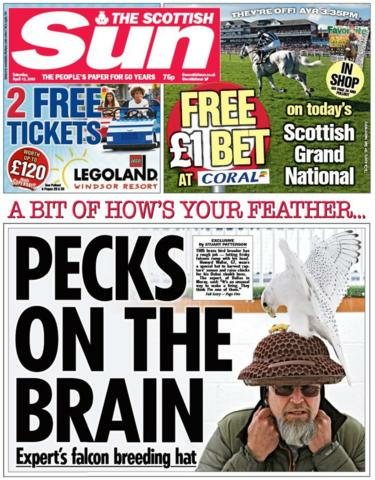 The Scottish Sun goes with a more light-hearted front page, as it tells of a falcon breeder who lets male falcons “romp” with a special hat while it is perched on its head. Howard Waller, from Dallas in Moray, uses the technique as part of a breeding process funded by his Dubai sheikh boss. 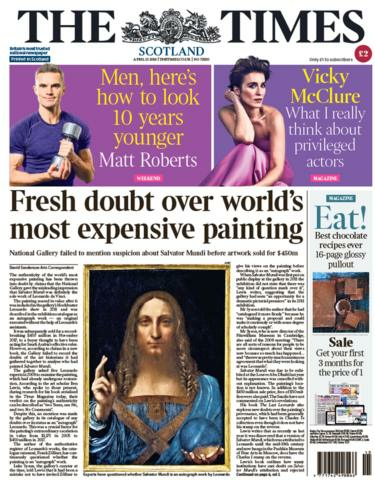 The Times says fresh doubt has been cast over the authenticity of the world’s most expensive painting, the $450m Salvator Mundi. The paper reports claims the National Gallery included it in an exhibition in 2011 but failed to publicise art historians’ doubts that the painting was the sole work of Leonardo da Vinci. However, the gallery is quoted saying the exhibition offered an opportunity to “test a new attribution by direct comparison with works universally accepted as Leonardo’s”. 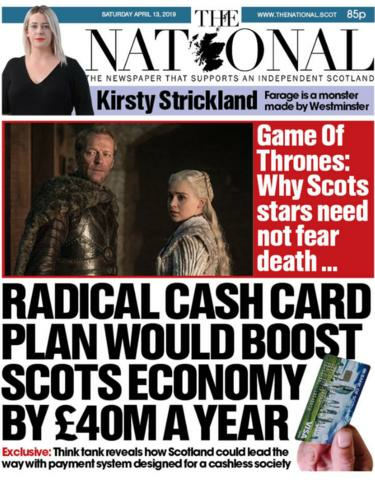 The National reports on the concept of a new payment system designed for a “cashless society”. it says Scotland could “lead the way” with the plastic payment plan and “boost Scotland’s economy by £40m a year”. The Press and Journal’s Highlands edition previews today’s first Scottish Cup semi-final at Hampden, where Inverness Caledonian Thistle take on Hearts. 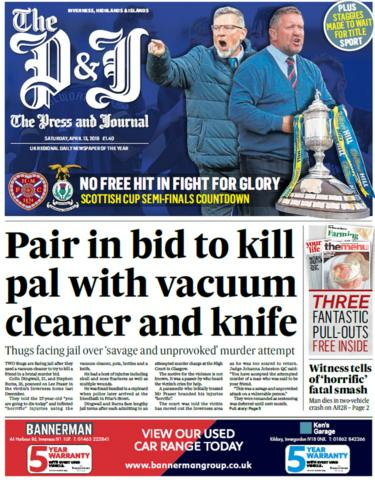 But it leads with two men facing jail after they used a vacuum cleaner to try and kill a former friend in an attack in Inverness. 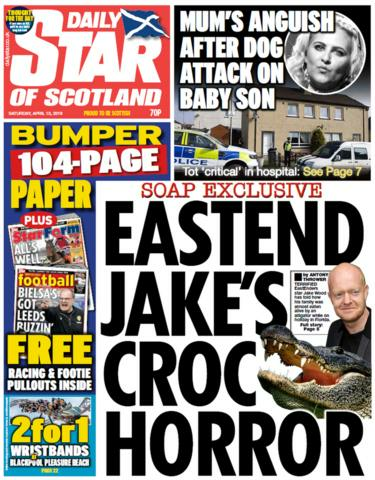 The big news for the Daily Star is that EastEnders actor Jake Wood and his family were “almost eaten alive” by alligators while on holiday in Florida… five years ago. The 46-year-old, who plays Max Branning, tells the paper that his wife was swimming in 2014 when he saw the “maneater” approach. 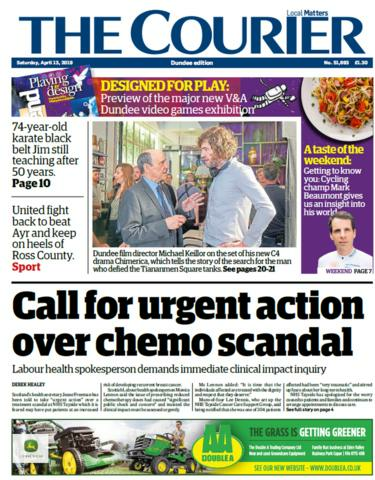 The Courier’s Dundee edition leads with Scottish Secretary Jeane Freeeman being urged to take action over a treatment “crisis” at NHS Tayside. It follows the revelation that a health watchdog had criticised NHS Tayside after breast cancer patients were given lower doses of chemotherapy than patients elsewhere in Scotland. An embattled, incompetent leader distrusted and disliked by a vast majority of voters. A wobbly economy that might be tipped into recession by Brexit. A re-energised opposition. 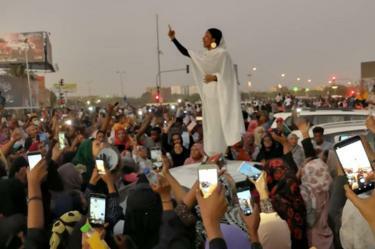 Huge street protests. Squabbling with European partners. The government is paralysed, the opposition is emboldened — and the nation stands humiliated, as the world looks on in horror wondering how a leader who was so popular two years ago could get things so wrong. Not Theresa May, but Emmanuel Macron, the politician who may be the greatest Brexiteer of them all. As the saga of British withdrawal enters its final chapter, Macron has emerged as the loudest advocate for pushing Britain out the door, deal or no deal, consequences be damned. Why does he behave in this way? Wouldn’t France suffer even more from a no-deal Brexit? But to understand his rage, you need to understand the depth of the hole in which he now finds himself. It’s now common for Brits to consider themselves the laughing stock of Europe. To be sure, the Westminster drama is embarrassing — but it could be worse. We could be France. Just two years ago, Macron was seen as the great centrist hope not just of France but of Europe. The country’s youngest ever president was elected aged 39¾ to the near unanimous approval of European bien pensants. He promised to drag France out of political, economic and social sclerosis, to see off the menace of populism, sack half a million supernumerary functionaries and make France great again. He quickly discovered that reform of a state riddled with clientelism and protectionism is easy to talk about but difficult if not impossible to achieve. His predecessors made the same discovery. His domestic failure has been spectacular and comprehensive. The suburbs are in turmoil and Macron’s vaunted reform project has ground to a halt. The legions of civil servants remain in place, many recently revealed to work less than 35 hours a week. State spending accounts for a gargantuan 58 per cent of the economy, with the highest taxes in Europe to pay for it all. Enterprise is crushed by further taxes on employment, which can double the cost of hiring a worker. Tax cuts are promised but undelivered and cannot be without inflating the alarming deficit or cutting back the state. The French have had enough. The opinion polls are striking. Macron is now the most unloved leader in Europe, by a distance, according to the YouGov Eurotrack survey. Among Britain, Germany, France, Denmark, Sweden and Norway, Macron has achieved a clean sweep, finishing dead last in every category. Do you approve of the government’s record to date? Seventy-six per cent of French voters disapprove. Do you think the financial situation of your household will change over the next 12 months? By a four-to-one ratio, they think it will get worse. Has the financial situation of your household changed in the past 12 months? Half say it has got worse, or a lot worse. How do you think the country’s economy has changed in the past 12 months? Fifty-seven per cent say it’s worse or a lot worse. A different poll found 75 per cent of French agree that Macron can be referred to as a ‘president for the rich’. The trajectory of the Macron project has been a case study in hubris. He has taken green politics and tested them to destruction. His putting up of fuel taxes last year while cutting the wealth tax was a manoeuvre so ill-judged as to beggar belief: it seems to show his contempt for those priced out of the cities, who live in provincial areas where they need cars. His diesel tax and carbon tax was the proximate cause for spawning the gilets jaunes movement, which is still bringing cities to a standstill every Saturday. His explanation that fuel prices had to rise to counter climate change cut little moutarde with voters. France has now had 21 consecutive weekends of demonstrations and riots in which thousands have been arrested, hundreds injured, many gravely, and ten killed. The frequent brutality of the police, relayed instantly on social networks, has been condemned by Amnesty International and the UN. The physical damage has cost hundreds of millions. The reputational hit has been much worse. Invest in France? Hopes of attracting many bankers from Brexit island have gone up in flames, along with the Porsches on the Avenue Kléber. Macron’s response has been to denounce protesters as ‘enemies’ of the state, and to impose new laws suppressing ‘fake news’. It’s easy to understand his allergy to reporting outside the usually obedient conventional channels. Sanctimonious he may be, but Macron’s probity is in as much doubt as his competence. His clumsy efforts to cover up a scandal in his inner circle, involving a handsome young bodyguard of North African origin, now fired, but apparently still in touch with Macron’s circle, have shaken even some of the normally complaisant Paris press corps. And now there’s his latest project, to launch his ambitious ‘EU Renaissance’, a largely inchoate big idea that has strikingly failed to resonate with French people, who have truly not a clue what he is talking about and whose own deeply eurosceptic views are ignored. Having failed to reform France from Paris, he seems to imagine that his reborn EU might do the job for him, delivering the country from 40 years of stagnation. With Europe as his standard, Macron’s fightback has been unconvincing. For several weeks, France has been treated to the embarrassing spectacle of his great national debate, launched to distract attention from the insurgency of the gilets jaunes. 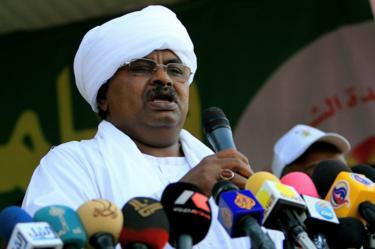 Hailed as a great exercise in consultative democracy, it’s been more of a monologue. He has toured the country, not debating, not listening, but talking, talking, talking, sometimes for three hours with nary a pause. Not even his handpicked audiences could feign rapt attention. It is a curiosity that Macron remains deeply admired abroad, notably by the Economist, whose Paris correspondent practically worships him, and the New York Times, which has annointed him the anti-Trump. The Washington Post has even swooned over his marriage — a triumph for feminism, apparently. But in France, even those who intend to vote for his list in the forthcoming European parliamentary election will hold their noses. As his economic reforms have ground to a standstill, and his attempts to buy off the gilets jaunes have pushed France’s debt to the very edge of 100 per cent of GDP, Macron now faces two further tests. Neither may work out for him. It is ironic that if Brexit is thwarted, only Nigel Farage is likely to be more disappointed than Macron. The second is the May election, in which he risks humiliation. Or maybe not. Voters who would otherwise vote for Macron as the lesser of two evils in a presidential election may be less scrupulous in a contest for the European parliament. The gilets jaunes are more likely to be motivated to vote, and Macron’s base may not be large enough to push him over the line. Whichever camp is able to declare victory, France is inevitably going to return a large number of eurosceptic MEPs, and with allies from across Europe, they are going to make Macron’s renaissance a mission impossible. Whither the boy wonder? Macron’s obsession with European federalism has not just alienated him from voters, but has irritated his most important ally, German chancellor Angela Merkel. Germany wants nothing to do with Macron’s proposed fiscal union. Why should Germans pay France’s debts? And lately, she has been especially alarmed by his inflammatory anti-British rhetoric. Macron might imagine that for the cause of his renaissance it’s essential to push the British out into the cold as soon as possible, deal or no deal. Merkel is listening to German industrialists, especially car makers, who call the UK ‘treasure island’. The prospect of a messy Brexit scares plenty of people in France, too. Officials in the north, closer to the UK than Paris, are in open rebellion. French farmers and fishermen are spooked by the potential loss of markets and fishing rights. Even my neighbours in the south, a long way from the United Kingdom, fear the impact on wine and tourism, which essentially is all they’ve got. When Macron was elected, a friend of mine who’d worked with him during his brief stint at Rothschild, and who found him an unlikeable and slippery colleague, nonetheless assured me that he was brilliant. He was always a swot, not just impressing but marrying his teacher. He won all the glittering prizes, admission to the École Nationale d’Administration, advancing thereafter to the status of haut fonctionnaire and economy minister under former president François Hollande. But he is utterly lacking in emotional intelligence. 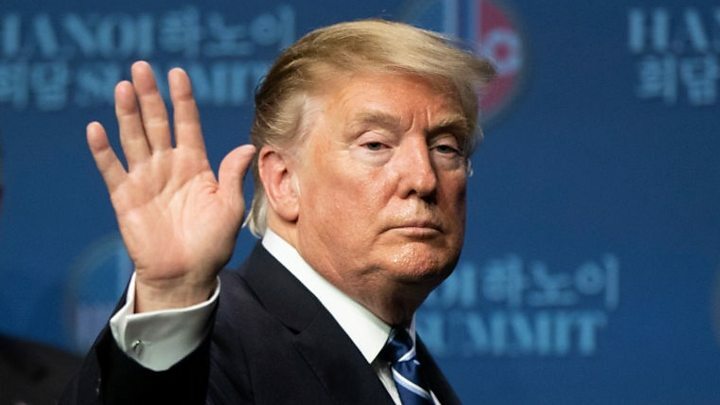 He has failed to temper his narcissism and grandiosity, failed to listen, failed to master the essential art of politics, which is to bring people together, not divide them. His attempted listening tours have ended in disaster. Last summer, he was filmed telling an unemployed gardener how to find work: ‘In hotels, cafés and construction, everywhere I go people say to me that they are looking for staff,’ he said. ‘I can find you a job just by crossing the road.’ The video went viral. In his stubbornness and near autistic indifference to others, Macron has united France against him. It will now be hard, perhaps impossible, for him to recover his popularity or his agenda which may help explain his Brexit obsession. He sees in it the concerns of provincial people who feel ignored by arrogant elites — the sort of people he’d hoped would go away. Brexit reminds him that they are unlikely to do so. As a result, his European renaissance is as undeliverable as the revolution he promised in France. Could Macron and Brexit make Paris the capital of European tech? Shortly after his election in May 2017, President Macron said he wanted France itself “to think and move like a start-up” – a vision of the country’s digital future that is gaining traction as Britain wrestles with Brexit. French President EMMANUEL MACRON’s vow to make France a ‘start-up nation’ amid the uncertainty ‘s over BREXIT, raising the question of whether could supplant London as the capital of European tech. Since his election, Macron has wooed tech entrepreneurs with a string of initiatives in the form of lavish tax breaks, subsides, and credits for research. In March 2018, he promised to invest €1.5 billion into artificial intelligence research through 2022. Some of these initiatives, in addition to Macron’s dynamism, have lured British tech companies who are looking to gain a foothold in EUROPE. Jones is among dozens of foreign entrepreneurs who have recently launched their start-up at Station F, whose 3,000 desk hub has seen spiralling applications from English-speaking nationals in the last two years. Some cite political woes back home, the burgeoning French tech sector, or are inspired by Macron’s bid to make Paris the innovation heart of Europe. “There’s an air of optimism and a can-do spirit in France that I feel we’ve lost somewhat in the US,” said Mark Heath, a New Yorker, who stayed on in France to launch a start-up after studying at INSEAD in 2017. Much of the investment in French tech predates Macron’s reforms. The state investment bank Bpifrance, launched by former French president Nicolas Sarkozy in 2013, has been widely credited with developing the sector. His successor, former French president François Hollande, set up new foreign visas for start-up entrepreneurs. But Zahir Bouchaary, a Briton who works out of Station F, credits Macron with injecting dynamism into the sector. “Macron has installed a [start-up] mentality within the French ecosystem itself,” said Bouchaary, adding that it has become much easier to do business in France in the last few years. The tech scene in London appears to be just as vibrant as ever, explained Albin Serviant, president of Frenchtech in London, who said many UK-based tech entrepreneurs are adopting a “wait and see” approach to Brexit. “The UK ecosystem is quite resilient,” said Serviant. “In the first quarter of 2019, there were about €2 billion invested in tech in London. That’s compared to 1.5 billion last year, which is plus 30 percent. And that’s twice as much as France – which invested 1 billion. France is catching up very fast but the investment money is still flowing in the UK,” he added. Serviant cited London’s business-friendly ecosystem and international talent pool as reasons for why London remains the capital of the European tech sector. Nonetheless Serviant cautioned against the effects that a hard Brexit would have on the tech sector in the UK. Hard Brexit would not just damage the UK tech sector but would also pose challenges for British developers, who post-Brexit may need a carte de séjour to work in the country, looking to find work in France. Sarah Pedroza, co managing director of Hello Tomorrow technologies, a Paris-based startup NGO, said that if she had to choose between hiring a British national and an EU citizen with the same skillset, she would opt for an EU citizen because there would be less paperwork involved. Brexit aside, others suggest that France is snapping at the UK’s technological heels. “I do think France has the potential under Macron to close the gap with the UK,” said Jones. Last month, Vice Foreign Minister Choe Sun-hui accused the US of taking a “gangster-like” stance, and said they had thrown away a “golden opportunity” in Hanoi.